If you’re thinking about applying for an MBA program, one of the first things you need to do is pass the Graduate Management Admissions Test, more commonly known as the GMAT. 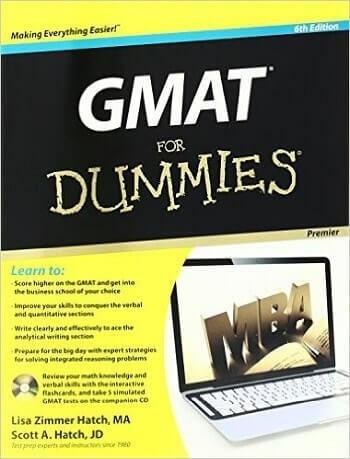 GMAT For Dummies, 6th Edition, was released last month and follows the tried-and-true Dummies formula of simplifying complicated material into a readable, friendly guide that gives you a succinct overview of everything you need to know to maximize your scores on this daunting test. With comprehensive math and grammar reviews, a plethora of updated practice questions, a thorough explanation of the new Integrated Reasoning section, and as many as five full-length practice tests in the Premier edition, GMAT For Dummies is the perfect resource to help you hone your skills, enhance your scores, and pass with flying colors as you look forward to a successful future in business. Purchase your copy today at the Hatch Education store or by calling 1.877.428.2407. And remember, don’t hesitate to contact College Primers with any GMAT-related questions you may have. After all, we wrote the book on it – literally!